The winner of the “Nika,” Russia’s equivalent of the Oscars, for Best Picture, and the country’s candidate for the Best Foreign Language Film Academy Award, 2005’s 9th Company is one of the most popular movies to emerge from post-Soviet Russia. And it performed quite well in its homeland as well, grossing some $27 million at the box office. Directed by Fyodor Bondarchuk (son of the legendary Russian filmmaker Sergei Bondarchuk of 1967’s War and Peace fame), 9th Company is a large-scale war movie about the Soviet Union/Afghanistan conflict that began in 1979 and continued for nearly a decade. 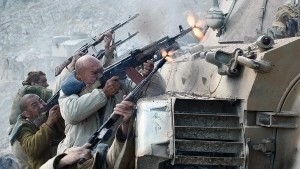 The film focuses on a group of young Soviet army recruits who are sent to the front at the beginning of 1989, the final year of the war, and forced into an extended, futuile and ultimately tragic battle with the enemy in the mountains, caves and villages of Afghanistan. Straight-forward, crisply filmed and episodic, 9th Company takes much of its inspiration from the Hollywood war films of the past 20 years: an intense grueling basic training sequence a la Full Metal Jacket, blur-free battle sequences shot with high speed film as in Saving Private Ryan, and the overall “grunts’ point of view” that was seen in Platoon. The young soldiers appear to have come from central casting — a new father, an artist who doesn’t believe in war, a zealous, kill-crazy patriot and so on. Their stories are all delivered with technical proficiency, and the climactic battle scenes are quite hairy. But as a narrative, the film is nothing we haven’t seen before (albeit from a very nationalistic Russian point of view) in such earlier Hollywood war efforts as The Green Berets or Hell is for Heroes. That said, 9th Company succeeds as solid entertainment for red meat-munching lovers of war movies. Special features on the Collector’s Edition DVD include a lengthy making-of featurette, cast and crew interviews and a newly recorded English-dubbed version of the movie that makes the film sound far too Hollywood-styled for our tastes. 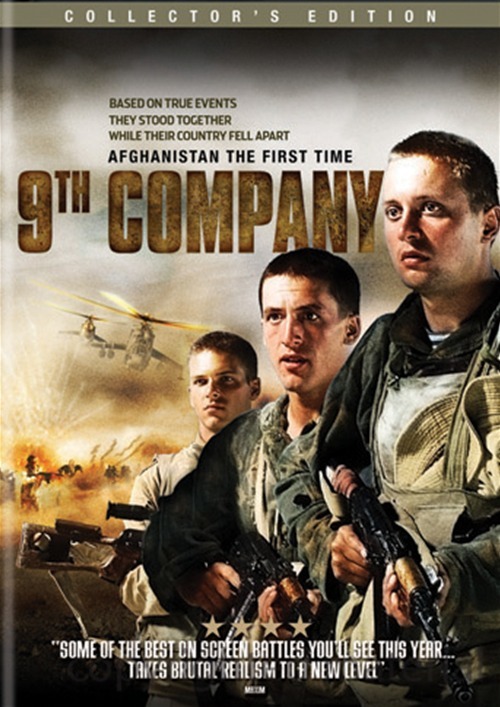 9th Company also is available as a standard DVD or Blu-ray Disc for $24.98 and $26.98, respectively.